Claire starts first grade tomorrow. Her backpack is packed up with markers, crayons, scissors and all the other (many) supplies she needs to start the year off properly. Her clothes are laid out and her lunch is ready in the fridge. Ben is ready for PreKindergarten. His lunch is ready, and in the morning we will pick out his clothes for the day. We had a lovely last two weeks of summer - the weather improved and we went into Manhattan to visit friends, went back to Central Park and back to Victorian Gardens. The kids have grown so much over the summer that I DIDN'T HAVE TO RIDE ANYTHING WITH THEM! 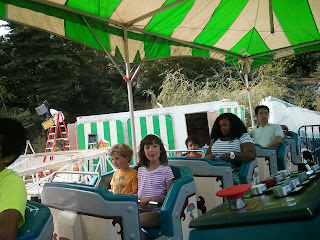 (Not a huge deal, but I get sort of dizzy on those little rides, and it was fantastic to watch them have fun together.) They rode every ride in the place. Some of them, twice! And I think Ben went on the big swings four times. I sort of lost count! We also went to the Long Island Children's Museum, and the Nassau County Firefighter's Museum. (located on Museum Row) That was a fun afternoon. And we had plenty of relaxation - building Legos, going to the park and playing with friends. Summer is nice. But we're all ready for something else. I am so happy for you that both kids are in school now. I suspect that will be good for all of you! Hope Ben loves prek.